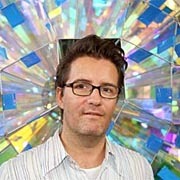 You are currently browsing the tag archive for the ‘Olafur Eliasson’ tag. 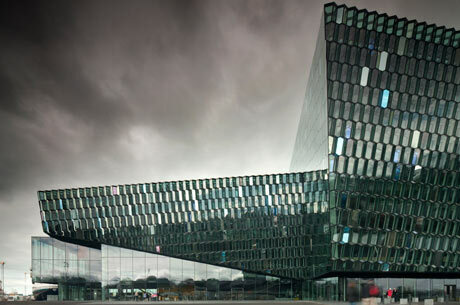 There are three reasons to be sceptical about the Harpa concert hall. One is that it is promoted as a “unique” artist-architect collaboration, when such collaborations are quite commonplace and often involve an alliance between architects with too little confidence in their ability to design buildings and an artist with too much. Then it is called “crystalline”, a word usually applied by hack practices to glass boxes with a few wonky angles. And it is in Iceland, the country that went so spectacularly bust that the British government mobilised anti-terrorism laws to freeze its assets. What business have they, three years after leading the world into the abyss, to be opening a $150m (£90m) building, with four halls for music and conferences, the largest of which has 1,800 seats, in a country of 300,000 people, and in a city the size of Ipswich? The facade of Harpa is the work of an artist, the Icelandic-Danish Olafur Eliasson, who gets more attention and a higher billing than the hall’s architects, the 52-year-old practice Henning Larsen Architects. They wear sober suits; Eliasson’s leather waistcoat and silver-framed shades suggest creative leadership. His job is to provide that service that would once have been performed by Corinthian columns and statues of buxom nudes: to endow the house of culture with meaning and importance. He has come up with a tilted cliff face made of multiple hexagonal glass tubes, with coloured and mirrored panes inserted here and there. Inside, the hexagons continue, forming a faceted and mirrored ceiling to the foyer. “If the doors of perception were cleansed,” William Blake once wrote, “everything would appear to man as it is, infinite” — infinitely personal, Mr. Eliasson might add, and infinitely interconnected. His business, above all, is the cleansing of the doors of perception. Visitors to his current show “Take Your Time” (continuing at the Museum of Modern Art and P.S. 1 Contemporary Art Center through June 30) are discovering immersive environments and sensory-deprivation devices of unfathomable beauty: a rotunda flooded in constantly shifting colors, a gigantic tilted mirror slowly rotating overhead, a cubic meter traced by lamplight in vapor in a darkened gallery. What sense can be made of these Zen mysteries? What do they mean? He is exquisitely attuned to nuances of sound and light, which he also recalls with Proustian accuracy. Strolling down by the waterfront, he finds beauty in a mound of road salt deposited under the Manhattan Bridge like sooty slush out of season. Pointing to the sky, he conjures up the trajectory of the sun and gathering darkness in terms that merge drama and epic. Olafur Eliasson, the Danish-Icelandic inventor and engineer of minimalist spectacle, is so much better than anyone else in today’s ranks of crowd-pleasing installational artists that there should be a nice, clean, special word other than “art” for what he does, to set him apart. There won’t be. “Art” has become the promiscuous catchall for anything artificial that meets no practical need but which we like, or are presumed or supposed to like. Still, play with the thought at “Take Your Time,” the Eliasson retrospective at the Museum of Modern Art and at MOMA’s affiliate, P.S. 1. By the way, please make the P.S. 1 trek—three stops on the No. 7 train from Grand Central. That part of the show details and deepens a sense of Eliasson’s creative integrity, which may remain slightly in question amid his stunts on West Fifty-third Street: an electric fan swaying on a cord from the ceiling of the atrium, rooms awash in different kinds of peculiarly colored light, a wall of exotic (and odorous) moss, a curtain of falling water optically immobilized by stroboscopic flashes. I had a little epiphany in Queens while looking at Eliasson’s contemplative suites of photographs of Icelandic landscapes, seascapes, glaciers, icebergs, and caves: here’s someone for whom beauty is normal. His character suggests both the mental discipline of a scientist and the emotional responsibility of a poet. If leadership in public-spirited art extravaganzas were a political office—and it sometimes feels as if it were—he’d have my vote. Spiegel: And you are about to embark on your final victory march in America. 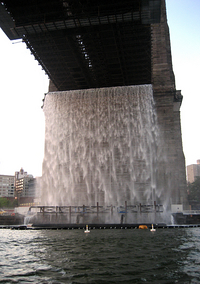 No one will be able to overlook your four gigantic waterfalls, up to 40 meters (131 feet) high, in the East River. Eliasson: Well, people who want to see everything will have to travel all the way across the city. We’re installing these waterfalls in very different parts of New York — under the Brooklyn Bridge, for example. The water will generate a true fog everywhere, and the pumps will be very loud. After all, real waterfalls make a lot of noise. Spiegel: But why does the city need its own Niagara Falls? Eliasson: I was interested in bringing life to a space that constitutes a non-space in New York, a space that simply doesn’t count. Wall Street is traditionally more important there that the water. In other words, I wanted to draw attention to something that has always been there and yet goes largely unnoticed. Spiegel: Do you always emphasize strong sensations? 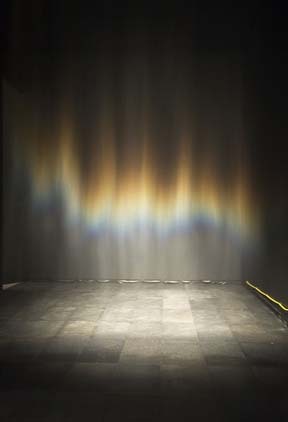 Eliasson: Yes, because physical experience makes a much deeper impression than a purely intellectual encounter. I can explain to you what it’s like to feel cold, but I can also have you feel the cold yourself through my art. My goal is to sensitize people to highly complex questions. Eliasson: Reality is confusing. That’s what I want to demonstrate. There is no fixed interpretation of my works. Everyone experiences and understands them in his own way. Eliasson: Christo is an amazing artist. But the way he exploits his projects and markets them so extremely, that’s not my style. Spiegel: But you too have crossed the boundary into commercialism. For instance, you designed an “Art Car” for BMW. Eliasson: Well, I do want to participate in the world, as it is. But look at it more closely: My art isn’t exactly market-friendly. Who buys a rainbow? Spiegel: Still, do you have the feeling sometimes that you are getting your fingers dirty? Proximity to business is frowned upon in the art world. Eliasson: This world of art and of museums can also be unbelievably elitist. But it isn’t a parallel world, where the laws of the market are somehow suspended. Artists don’t live in a space apart from politics and the market, and in many cases they even have very good strategies to market themselves. It would be hypocritical to claim otherwise. But believe me, my fingers are clean. Spiegel: More than two million people went to see your “Weather Project,” a colossal sun sculpture, at the Tate Modern in London four years ago last winter. The minute an artist reaches large numbers of people, he is accused of going mainstream. Is that a problem for you? Eliasson: Appealing to many people isn’t a problem for me. I don’t happen to be one of those people who climb up on their avant-garde stools and look down on others. We should stop nurturing this naïve cliché that says artists are beings from another planet. It wasn’t God himself who hung art in museums. And yet the museum directors create precisely this detached impression. It would be much more honest to talk about the many connections and influences, because they exist. The market exists, and so do ideologies. Spiegel: Your art, which is in tune with nature, is often associated with your native Scandinavia and its landscape. Eliasson: Yes, but this relationship should not be understood as a key to my art. The circumstances under which I grew up in Denmark are more important than nature: in a society that was shaped by pseudo-Protestantism, and by the ideals of the middle class and the welfare state. The individual was less important than the community. Recognizing this, identifying it as a source of tension, has influenced me. Besides, it is also typically Scandinavian to think: I am nothing, and nature is everything. Of course, I too had this attitude. My parents are Icelanders, and Iceland, which I visited regularly as a child, is a unique natural experience. 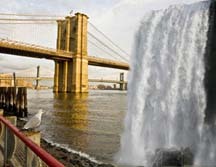 Olafur Eliasson, a Danish–Icelandic artist whose installation “The Weather Project” drew 2 million people to the Tate Modern in 2003 and 2004, has designed what will likely be the city’s biggest public art project since Christo and Jeanne-Claude’s “The Gates”: a series of freestanding waterfalls in the East River. Mayor Bloomberg and the Public Art Fund, a private nonprofit organization that produced, among other works, Anish Kapoor’s “Sky Mirror” and Jeff Koons’s “Puppy,” both at Rockefeller Center, are scheduled to announce Mr. Eliasson’s project at the South Street Seaport tomorrow.